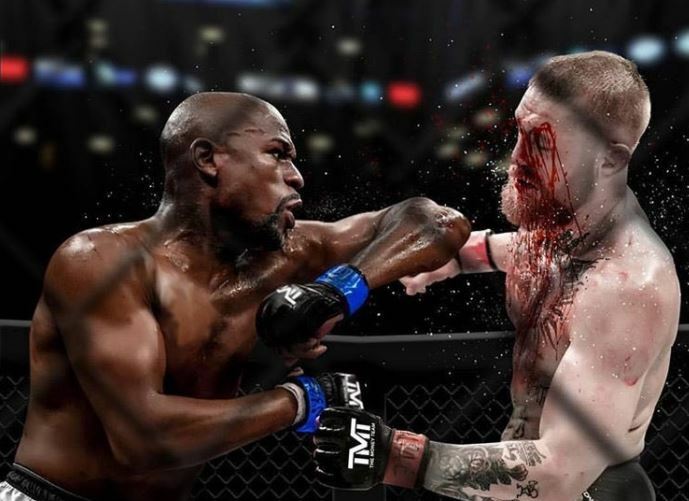 Floyd Mayweather continues to stoke the flames for an MMA fight with Conor McGregor after the two had a boxing match last year in Las Vegas. It seems like a crazy idea for a 40-year-old man who’s never had experience of fighting in the MMA cage to step in on his pro debut against one of that particular sport’s most vicious fighting sons. McGregor has proven himself in the world of the UFC with ruthless knockouts. But then again, when you consider that he stepped into the boxing ring as a professional for the first time with Mayweather back in August, is this any different? The logical school of thought being though that this is much riskier for Mayweather than what that was for McGregor. An interesting piece of art work indeed but how realistic is it? This seems like good old Floyd Mayweather taking his hand at another pre-determined outcome type-event like he did before with the Big Show at WrestleMania. On that occasion, Mayweather and the Big Show conned a large number of people (including this writer) into buying the wrestling event pay per view on the basis of thinking it would be a real fight. However when the pair actually ‘fought’ it turned out to be simply entertainment, in the end. Just like this Mayweather vs McGregor ‘MMA fight’ will be.